Arguably, the heart of Hilton Head Island is Sea Pines. And certainly the heart of Sea Pines is Harbour Town. 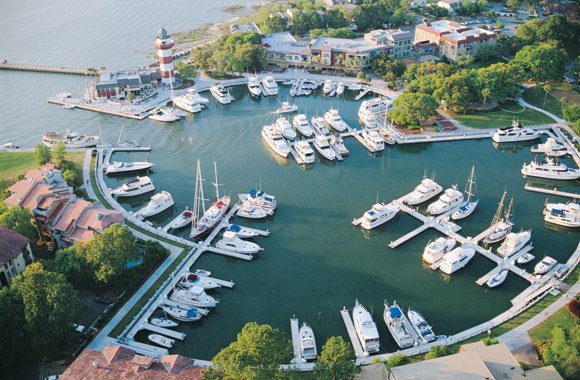 At its core, Harbour Town is a beautiful marina village. Numerous unique shops, excellent restaurants, the famous Harbour Town Lighthouse, the Liberty Oak and a beautiful playground are the essential components of Harbour Town. However, Harbour Town also has so much more. The Inn at Harbour Town is a charming 60 room boutique hotel. The Sea Pines Racquet Club, next door to the Inn, is consistently ranked as one of the best in the country. And, of course, the Harbour Town Golf Links plays host to the PGA every spring at the RBC Heritage. The real estate opportunities within Harbour Town are quite varied. The townhomes on the 16th, 17th and 18th holes of the Harbour Town Golf Links are some of the most sought after real estate on the Island with views across the marshes and Calibogue Sound These and the villas overlooking the marina enjoy spectacular sunsets…some of the very best on Hilton Head. The Stoney Creek area has villas and single family homes with views over the marsh and beyond to the Calibogue Sound. All these real estate opportunities share the excitement and the activities of Harbour Town. During the summers, Greg Russell, an island legend, provides music each night under the Liberty Oak. Families stroll around the Harbour, admiring the boats, enjoying the sunsets and the fun that is Harbour Town.